This article will not be a chemistry class on the various types of paints, finishes and their compatibility which each other. There is tremendous amounts of information readily available on this subject and I will not repeat it here. Rather, I will describe a Process you can follow to get the desired result. Step 1……. Identify what type of paint and top coat you should use. The top coat being an optional layer of finish to go over the paint, such as a glossing product. 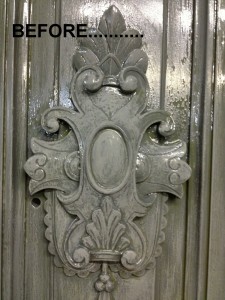 Generally this isn’t needed but in some cases it is used to achieve a desired result when painting a front door. Again, this isn’t a chemistry class so I won’t give advice on what product should be chosen to ensure compatibility with the existing finish on the door. Rather, I suggest you visit your local paint store (Sherwin Williams, Lowes, etc) and discuss your project with a qualified professional. 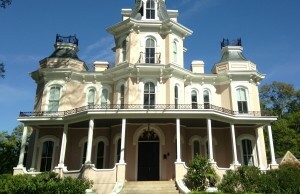 You are purchasing the paint there any way, so take advantage of their expert advice. If you can scrape off some paint chips from the existing door, do so and take them into the paint store. The paint expert will be able to determine what type of paint is on the door and make appropriate recommendations. Here is an example of product compatibility gone wrong. Notice the before picture and the yellowing, bubbling of the finish. The previous finisher used incompatible products. Here is the after….. notice how smooth and pretty the finish is…. Step 2…… Prep the door…. In this step the surface is prepared for receiving the new coat of paint. A common misconception is that all the previous paint must be removed before applying new. Not true…. if you follow Step 1 correctly and get a compatible product you do not need to remove all the previous paint. 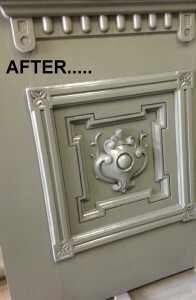 Rather, the work you do in this step is a function of how smooth you want the final painted finish to be. At a minimum (for any door you are repainting) you lightly sand the entire surface with 150 grit sandpaper before applying a new coat of paint. This sanding of the surface in essence cleans and scratches the surface allowing the new coat to adhere better. If you have extensive layers of old paint and/or are looking for an extremely smooth finish (similar to what is shown in the above after shot), then the sanding process becomes much more intensive. In the example above, we took everything back down to the bare wood. 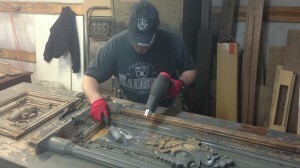 These doors were from a home on the Historic National Registry and we were looking for an extremely fine finish. To remove all the paint (or enough to get the smoothness you want) use a combination of sand paper, heat guns or paint stripping chemicals. For most applications a thorough sanding is more than enough. Start with an aggressive sandpaper (80 grit) and sand/level the surface. Then move up to 150 grit paper and sand again. Finally, go over with 220 grit paper. For most applications this is more than enough to get the desired smoothness you need. In the example shown above we begin by using a combination of 80 grit sandpaper, heat guns and paint removing chemicals to get all the paint off. After the paint was removed we then sanded back up through 220 grit sandpaper (started with 80 grit, then 150 grit then 220 grit) Further, we actually used carving chisels to get into all the nooks and crannies of the carvings. By removing the countless layers of paint we were able to once again see and enjoy the carving details which were hidden by the thickness of the paint. Step 3…… Applying the paint……..
To achieve a smooth blemish free painted finish sand in between coats of paint!!! Apply the paint in thin coats, don’t slop it on…… Then lightly sand with 220 grit paper in between coats. Once again, this levels the paint and removes brush struck lines, etc… After about three coats I’m generally able to get the smoothness and coverage that I like. But don’t be afraid to do more. Remember, thinner multiple coats are better than thicker few coats!!! 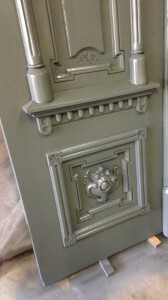 Here are some more pictures of the doors for the historic home we did.